To break or not to break – that is a choice! Traditionally vocal breaks, whether intentional or unintentional, are seen as the change in registers. Some singers exploit these breaks for artistic effect. More often singers wish to smooth these breaks in a controlled manner without an obvious change in voice quality or signs of voice instability. The Complete Vocal Technique defines the voice as having four vocal modes Neutral, Curbing, Overdrive and Edge. Each mode has different degree of metallic character and advantages and limitations in terms of pitch range, volume, character and type of vowel sound in which they can be sung. Vocal breaks or their avoidance is seen as either an abrupt transition between modes or a smooth change between modes respectively. A study of twenty singers using synchronised Laryngostroboscopy with the Electrolaryngograph (Laryngograph®) and the analysis of pitch glides using the Laryngograph® Speech Studio program was performed. This has provided us with a clearer understanding of differences between intentional and unintentional voice breaks and how these can be taught and controlled. – A presentation of the concepts of vocal modes. – Video and Laryngographic evidence from the study of smooth changes between modes or intentional breaks. – A demonstration using singers on how to use or avoid breaks as required. – Involving of all participants on how to avoid any unwanted vocalbreaks – and how to obtain intentional vocal breaks. Cathrine Sadolin is the developer of ‘Complete Vocal Technique’ (CVT). CVT is spreading fast. Since the opening of ‘Complete Vocal Institute’ in Copenhagen in 2005, more than 1.000 singers from 28 countries have been attending an education. Today 128 Authorized CVT Teachers are working individually in 15 countries, and from 2013 the number will be 200 in 18 countries. Cathrine Sadolins bestselling book about CVT is published in English, Danish, Swedish, Finnish, Dutch, German and now also in French language. A Spanish version is expected later this year. This interactive workshop is targeted to voice teachers of all styles. Its aim is to share one view on how a voice teacher can structure their pedagogical thinking. It also offers a forum to discuss the values different teaching methods and conventions represent. Teaching singing is often divided to two main genres, classical and pop/jazz. Pop/jazz can have many different names and include a vast array of styles, many that have nothing to do with pop or jazz. It’s not uncommon nowadays that a singer might want to learn how to belt, sing death metal or even do Tuvan throat singing. As more and more people get interested in various vocal styles and seek help from voice professionals to develop their artistry, it is clear that a singing teacher can very seldom base their teaching on just one style. For voice teachers as well as any other teachers it is important to be and become more aware of one’s pedagogical thinking and how different levels of it affect the teaching process. 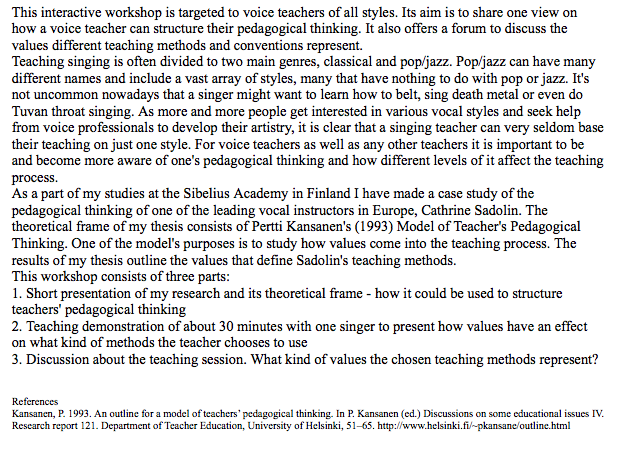 As a part of my studies at the Sibelius Academy in Finland I have made a case study of the pedagogical thinking of one of the leading vocal instructors in Europe, Cathrine Sadolin. The theoretical frame of my thesis consists of Pertti Kansanen’s (1993) Model of Teacher’s Pedagogical Thinking. One of the model’s purposes is to study how values come into the teaching process. The results of my thesis outline the values that define Sadolin’s teaching methods. 3. Discussion about the teaching session. What kind of values the chosen teaching methods represent?